Wow. That more Jigglypuffs than the entire USA! When do sellthrough reports come through? As for PS4 version Witcher 3's digital copy is like 20-30% of retail ver (mentioned at niconico stream). So about 82K combined? Just below Xenoblade X. Also implies pent-up demand if high-sell through+high digital proportion. Next few weeks may be interesting to see if it has GTA V-esque legs. Well in this case relatively high digital ratio (if it is really that high) is the indication that sales are very front-loaded, especially when there were shortages IMHO. Main target of PS4/XB1 are ones with more disposable income so they'll just go digital if they can't find physical copies at retail stores. Last time Yodobashi did something like this was for Ruby/Sapphire and Yo-kai Watch 2. Splatoon is here to save Japan! All of Japan is a squid now. Or a kid. Yodobashi has Splatoon available in all shops, you forgot to let us notice ? 200k would be really good, will have to see if it has legs or if it's something people will get bored of quick. Seems like Nintendo invested a lot in marketing for it. The guy never said 200k opening week is expected..
Now let's see if it can sell some hardware. PS3/PSV/PS4 release in November confirmed. RIP Azito Legends. 100K plus seems good to me. Being a new IP (and concept) it seems unlikely to have front loading but more of a slower burn (unless it died instantly like STEAM which does not seem to be the case). If it does decently upfront and has some good word of mouth I could easily see it having some legs. ..and that is the game for ladies, so platform choice is really baffling. On the bright side some stores are enjoying relatively good sales, thanks to lady gamers. On the other hand Wolfenstein is so low that sales is really non existent (so does the blogger say).. Pretty good start for Splatoon . Over 100K (~112K) first day debut. 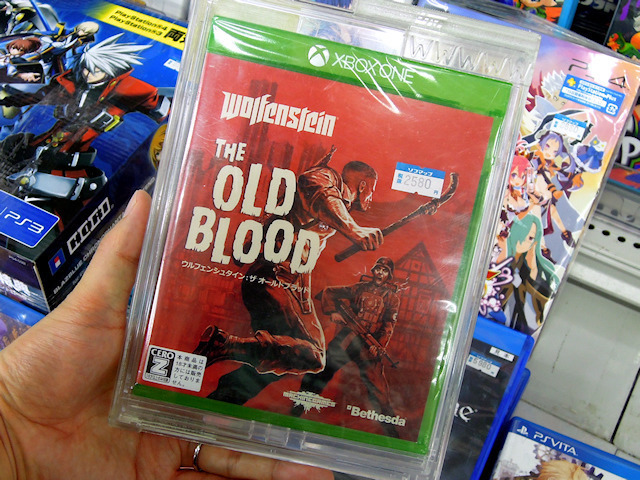 Is Wolfenstein: New Blood only for XB1? Or is the PS4 version's sales just not mentioned. Ohh yiissssss!!!!! Also Amazon expects a new shipment on May 30th! 1 million in the first 12 minutes. Don't settle for small, go for broke. Expect 1 billion by century's end. Can't find the name of the first game that sold 1000 units, someone help me out. Afaik, there is only one version at retailer shops. I mean, I guess is the only one at Sofmap. I think it was Type-0. But MC isn't saying it sold exactly 1.000 units. It's more an aproximation. The game is ranked at 46 place in MC. The blog only talked about XB1 version. Maybe we'll have an opening closer to 200k than 150k if there is the stock. Splatoon new gaming phenomenon of this generation? Sorry guys, the blogger edited. It seems it's 150k first day shipment (not 140k as previously said). You sorry? This is even better! What were the YSO predictions? > 150.000? 150k!? That's not nearly enough, we need 1500k! That's ~120k sell-through. Much nicer. Oh Splatoon, I always felt it had a huge sales potential, but I wouldn't have bet on Japan. Wow. I really hope Splatoon's reception sends a message to Nintendo that consumers want more BIG new IPs from the company. I love their smaller games like Boxboy, Pushmo, Code Name STEAM, etc. but Splatoon is something bigger and it has been great to see Nintendo treat it as such. I'm so happy to see Japan react positively to the game. Spectacular start from the squids, has there been any hints of selling outs and/or restocks yet? Well, in Yodobashi Camera some stores ran out of stock yesterday (according to its own website), but today all of them they have stock available. That means they already received a new shipment today. Yamada Denki has the game sold out. Time to further improve the marketing for this game by having the ULTIMATE COLLABORATION, Shokugeki no Soma x Splatoon x Ika Musume. Why Stop there? Splatoon is going to Invade and Rule over our Civilization. Having some stores run out of copies after 19:00 and such is the sign of shipment was just right (and they got replenished too so it is also good). Let's get crazy, what if Splatoon actually has legs?! Needs to turn back into a kid. Seriously, if promotions and ads continue for this game, it may become another evergreen title for Nintendo. Not as big as Mario or Pokemon, but a game that may continue to sell brand new in small trickles down the line. Rated M for murder and violence, and "cannibalism". The only aspect that Splatoon has bigger than STEAM is the marketing push, imho. it's not that a "better" (subjective term) art direction is "bigger" in terms of budget. You can't put STEAM aside an eshop puzzle game imho. Hey, hey, hey! Guess which game just got delayed to July 30th? ..... Yup, IA/VT! Guess they realised launching the same day as P4D wasn't smart at all. Dat typo in the URL, ha ha.